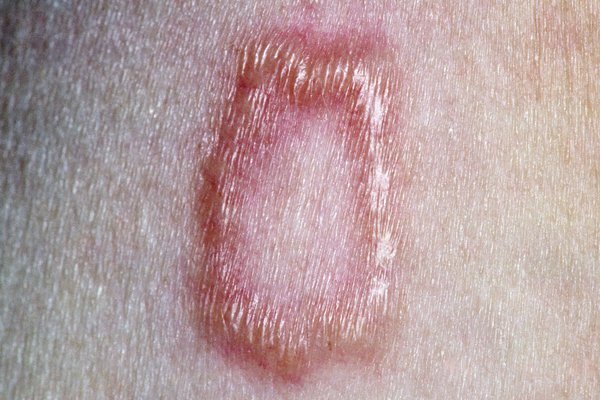 Granuloma annulare is a rash that often looks like a ring of small pink, purple or skin-coloured bumps. It usually appears on the back of the hands, feet, elbows or ankles. The rash isn't usually painful, but it can be slightly itchy. It's not contagious and usually gets better on its own within a few months. Granuloma annulare is more common in children and young adults, although it can affect people of all ages. It's about twice as common in women. The most common type, localised granuloma annulare, appears in just one or two areas, tends to affect children and young adults, and usually gets better on its own after a few months. Pink, purple or skin-coloured patches typically appear on the fingers, backs of the hands, feet, ankles or elbows. They form rings that grow slowly until they're about 2.5-5cm (1-2 inches) across. As the rings get bigger, they become flatter and more purple in colour before eventually fading. In localised granuloma annulare, the top of the skin feels smooth and, unlike in other skin conditions, such as pityriasis versicolor, ringworm or eczema, it isn't rough, dry or scaly. The affected skin also feels firm as a result of inflammation in the middle layer of skin (dermis). There's no change in the outermost layer of skin (epidermis). More rarely, you can develop a widespread rash, known as generalised or disseminated granuloma annulare. It usually affects adults. Large pink, purple or skin-coloured patches appear on a larger portion of the body, including the trunk, arms and legs. 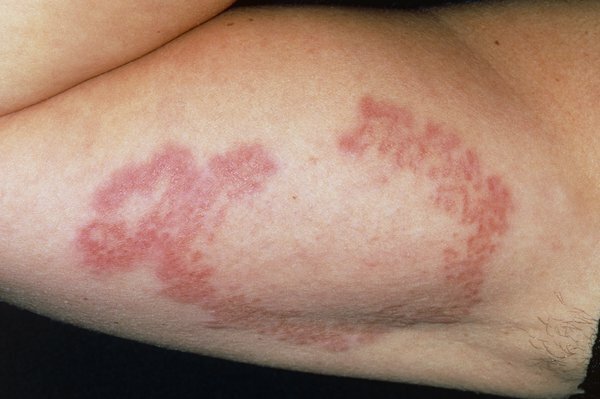 The rash is sometimes made up of small raised spots that form symmetrical rings 10cm (4 inches) or more across. They're often found in skin folds in the armpits and groin. Granuloma annulare under the skin usually affects children. One or more firm, rubbery lumps develop under the skin. They can range from 5mm-4cm (0.2-1.5 inches) in size. They can appear on the shins, ankles, feet, buttocks, hands, scalp and eyelids. See your GP if you have an unexplained rash that doesn't disappear within a few weeks. They'll usually be able to diagnose granuloma annulare from the appearance of your rash. A skin biopsy may be needed to diagnose the rarer types of granuloma annulare. A small sample of affected skin is taken so it can be studied under a microscope in a laboratory. A blood glucose test may also be recommended. This is because in rare cases granuloma annulare can be linked to diabetes. Unfortunately, there's no really effective treatment for granuloma annulare. But in most cases, treatment isn't necessary because the rash will disappear on its own within a few months to two years. If you find the appearance of the rash upsetting, you could try using skin camouflage products. Watch this video about skin camouflage and how it can be used to cover marks and scars. The tissue underneath the top layer of skin (dermis) becomes hypersensitive and inflamed. It's not clear what causes the skin to react in this way. Granuloma annulare isn't caused by allergies and doesn't run in families. It's sometimes associated with diabetes, although this is rare.